Dislocation of the ankle usually occurs with fractures of the malleoli or of the posterior aspect of the tibia because the ankle’s ligamentous structures are, in most cases, stronger than the osseous architecture. In addition to a strong association with fractures,  ankle dislocations are often open because of the thin layer of tissue that lies over the malleoli. Posterior dislocation of the talus is the most common form of ankle dislocation, though medial, anterior, lateral, and superior dislocations have been well described. Individuals at increased risk for ankle dislocation injuries include those with a history of prior ankle fractures, ankle sprains, weakness of the peroneal muscles, malleolar hypoplasia, or ligamentous laxity such as may occur with Ehlers-Danlos syndrome and other connective tissue disorders. An ankle dislocation represents a high-force traumatic injury that often occurs in vehicular collisions or sports that involve jumping. The clinician must, therefore, examine the patient thoroughly for additional injuries. The energy of the traumatic insult usually either forces the ankle into a position of plantarflexion or strikes the ankle while it is already in a resting position of plantarflexion. Once in plantarflexion, all capsular ligaments of the ankle (with the exception of the posterior talofibular ligament) are stretched and, therefore, more susceptible to structural failure. In addition, plantarflexion brings the smaller surface area of the posterior edge of the talus into the mortise of the ankle, which makes translational forces on the talus more likely to dislodge it from the joint. 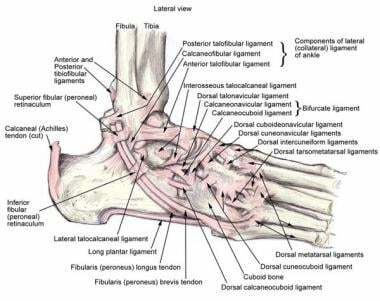 Injuries that cause subsequent inversion of the ankle lead to posteromedial displacement and tears in the anterior talofibular and calcaneofibular ligaments. Eversion injuries are more likely to produce lateral dislocations and rupture of the talotibial ligament and medial joint capsule. Inversion injuries are more common as a result of axial loads from falls from significant height. The rupture of the ankle’s capsular structures is often severe, and the risk of infection secondary to open injury is often significant; however, prompt reduction and, when warranted, operative debridement and repair usually lead to excellent functional recovery and long-term prognosis. Immediate recognition and early reduction of the dislocated ankle are essential, in that delayed reduction may lead to subsequent loss of range of motion (ROM) and increased morbidity. Subtalar dislocations are rare (<2% of large-joint dislocations) and are the result of high-force mechanisms of injury directed at the forefoot. Of note, 10-20% of subtalar dislocations are irreducible by closed methods and require operative intervention. Radiographs of the ankle, including anteroposterior (AP), lateral, and mortise views, may quickly and reliably differentiate between ankle and subtalar dislocations. As noted, it is essential to differentiate an ankle injury with dislocation from a subtalar dislocation (see Table 1 below). An attempt to reduce a subtalar dislocation with ankle reduction techniques is likely to be unsuccessful and may lead to further injury of the involved articular structures. The combined movement in the dorsiflexion and plantarflexion directions is greater than 100°; bone-on-bone abutment beyond this range protects the anterior and posterior ankle capsular ligaments from injury. The anterior and posterior ankle capsular ligaments are relatively thin in comparison with the medial and lateral ankle ligaments. (See the image below.) For more information about the relevant anatomy, see Ankle Joint Anatomy. Arnold C, Fayos Z, Bruner D, Arnold D. Managing dislocations of the hip, knee, and ankle in the emergency department. Emerg Med Pract. 2017 Dec. 19 (12):1-28. [Medline]. [Full Text]. Wight L, Owen D, Goldbloom D, Knupp M. Pure Ankle Dislocation: A systematic review of the literature and estimation of incidence. Injury. 2017 Oct. 48 (10):2027-2034. [Medline]. Syed AA, Agarwal M, Dosani A, Giannoudis PV, Matthews SJ. Medial subtalar dislocation: importance of clinical diagnosis in distinguishing from other dislocations. Eur J Emerg Med. 2003 Sep. 10(3):232-5. [Medline]. Rammelt S, Goronzy J. Subtalar dislocations. Foot Ankle Clin. 2015 Jun. 20 (2):253-64. [Medline]. Jungbluth P, Wild M, Hakimi M, et al. Isolated subtalar dislocation. J Bone Joint Surg Am. 2010 Apr. 92(4):890-4. [Medline]. Conesa X, Barro V, Barastegui D, Batalla L, Tomás J, Molero V. Lateral subtalar dislocation associated with bimalleolar fracture: case report and literature review. J Foot Ankle Surg. 2011 Sep-Oct. 50 (5):612-5. [Medline]. Rivera F, Bertone C, De Martino M, Pietrobono D, Ghisellini F. Pure dislocation of the ankle: three case reports and literature review. Clin Orthop Relat Res. 2001 Jan. 179-84. [Medline]. Demiralp B, Komurcu M, Ozturk C, Ozturan K, Tasatan E, Erler K. Acute traumatic open posterolateral dislocation of the ankle without tearing of the tibiofibular syndesmosis ligaments: a case report. J Am Podiatr Med Assoc. 2008 Nov-Dec. 98 (6):469-72. [Medline]. Georgilas I, Mouzopoulos G. Anterior ankle dislocation without associated fracture: a case with an 11 year follow-up. Acta Orthop Belg. 2008 Apr. 74 (2):266-9. [Medline]. Gogi N, Khan SA, Anwar R. Anterior dislocation of the tibio-talar joint without diastasis or fracture--a case report. Foot Ankle Surg. 2008. 14 (1):47-9. [Medline]. Lertwanich P, Santanapipatkul P, Harnroonroj T. Closed posteromedial dislocation of the ankle without fracture: a case report. J Med Assoc Thai. 2008 Jul. 91 (7):1137-40. [Medline]. Mazur JM, Loveless EA, Cummings RJ. Ankle dislocation without fracture in a child. Am J Orthop (Belle Mead NJ). 2007 Sep. 36 (9):E138-40. [Medline]. Thangarajah T, Giotakis N, Matovu E. Bilateral ankle dislocation without malleolar fracture. J Foot Ankle Surg. 2008 Sep-Oct. 47 (5):441-6. [Medline]. Mubark I, Anwar S, Hayward K. Closed posterior ankle dislocation without associated fractures: a case report. J Surg Case Rep. 2017 Aug. 2017 (8):rjx165. [Medline]. [Full Text]. Horn AE, Ufberg J. Management of common dislocations. Roberts JR, Custalow CB, Thomsen TW, et al, eds. Roberts and Hedges' Clinical Procedures in Emergency Medicine. 6th ed. Philadelphia: Elsevier Saunders; 2014. 954-98. Budd H, Wimhurst J, Davis B, Hutchinson R. Irreducible posterior subtalar dislocation with incarceration of a fracture of the anterior process of the calcaneum. J Bone Joint Surg Br. 2010 Jul. 92 (7):1025-7. [Medline].